Australian artist and novelist Norman Lindsay was born on February 23, 1879 to Dr. Robert Charles William Alexander Lindsay (b. Londonderry, Northern Ireland 1843) and Jane Elizabeth Williams in Creswick, Victoria, Australia. “Lisnacrieve” was the name of the Lindsay home where Norman was born. It was located on Victoria Street, Creswick, next to an old Methodist Church. A modern brick house now stands on the site but a small stone monument, commemorating the centenary of the birth of Norman Lindsay is posted there. Norman was one of ten children, Percival Charles Lindsay (1870-1952), Robert Elliot Alexander Lindsay (1872-1951), Lionel Arthur Lindsay (1874-1951), Mary Eleanor Beatrice Lindsay (1877-1968 ), Norman, Pearl Irene Leanore Lindsay (1883-1968), Ruby Lindsay (1887-1919), Reginald Graham Lindsay (1888-1916), Daryl Ernest Lindsay (1899-1976) and Jane Isobel Lindsay (1894-1965), many of whom were equally accomplished in the arts and distinguished in the art world. Their artistic capabilities have been attributed to their mother, and her father, the Rev. Thomas Williams. 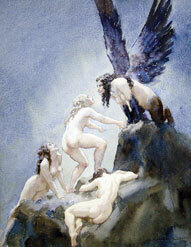 Norman Lindsay died November 21, 1969. Norman Lindsay left Creswick when he was 17 and joined his brother Lionel, also a prominent artist, in Melbourne Victoria, where he began a career as principal cartoonist for the Australian Bulletin. Although his prominence as an artist grew he still continued his work with the Bulletin for many years. During this time he married Catherine (Katie) Parkinson and had three sons, Jack (1900-1991), Raymond (1903-1960) and Phillip (1906-1958) with her. Katie left Norman about 1909 and died in 1949 in Brisbane. In 1911, after living in England for a number of years, Norman returned to Australia and moved to the Blue Mountains, west of Sydney, with his second wife Rose Soady (1885-1978). Norman and Rose were the parents of two daughters, Jane (1920-?) 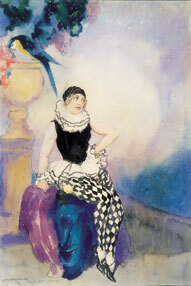 and Helen (1921-?). Norman Lindsay’s home today, under the guidance of the National Trust, houses a great deal of his work and is the Norman Lindsay Gallery and Museum at Faulconbridge via Springwood in New South Wales. In addition to his many works of art, Norman Lindsay was the author of eleven novels. These novels were, “Curate in Bohemia” 1913, “Redheap” 1930, “ Miracles by Arrangement” 1932, “ Saturdee” 1932, “Pan in the Parlour” 1933, “The Cautious Amorist” 1934, “ Age of Consent” 1935, “Cousin from Fiji” 1945, “Halfway to Anywhere” 1947, “Dust or Polish” 1950, and “Rooms and Houses”. There were also two children’s books entitled, “The Magic Pudding” 1918, and “The Flyaway Highway” 1936. Other books included an autobiography: My Mask 1970, and “Reminiscences: Bohemians of the Bulletin”.